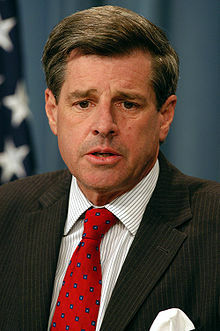 Lewis Paul Bremer III is an American author and politician. He was born on September 30, 1941. He was named "Director of Reconstruction and Humanitarian Assistance" on May 6 for Iraq in 2003, after the war..
Bremer was born in Hartford, Connecticut. He grew up in New Canaan, Connecticut. He went to school at Phillips Academy and graduated in 1959. Then he went to Yale University. He received a Bachelor of Arts degree in 1963. In 1996, he received a master's degree from Harvard University. His degree was in business. He also received a degree in Paris. In 1967, he joined the United States foreign service. At first he worked in Kabul, Afghanistan. He also worked in Blantyre, Malawi from 1968 to 1971. He worked for the United States State Department for 23 years. During that time, he worked for six different Secretaries of State, including Alexander Haig. A Secretary of State is the top government official in the U.S. State Department. A secretary of state is appointed by the United States President. He also worked as a deputy chief at an American embassy in the country of Norway. A deputy chief is a person in charge at the embassy. In 1983, President Ronald Reagan appointed Bremer to the position of Ambassador to the Netherlands. He also became "Ambassador at Large for Counter Terrorism." Bremer retired in 1989. Then he spent the next 15 years working in private (non-government) companies. One of the companies he worked for was Kissinger Associates (a company that was run by someone who used to be a Secretary of State, Henry Kissinger). He also served as a board member for several corporations. A board member is someone who makes big or strategic decisions on how a company should operate. Mr. Bremer has served on the board for corporations such as Air Products and Chemicals Incorporated, Akzo Nobel NV (a Dutch company), and Marsh Crisis Consulting Company. Bremer speaks many languages besides English. He speaks Arabic, French, Dutch, Norwegian, Persian, German, and Spanish. Bremer is married to named Frances Winfield. They were married in 1966. They have two adult children and two grandchildren. After he worked in Iraq, Bremer wrote a book. The title of the book is My Year in Iraq: The Struggle to Build a Future of Hope. The book was published in January 2006.